Sold! Congrats to Ma & Pa on selling their house. May your new adventure be a fun & adventurous one. 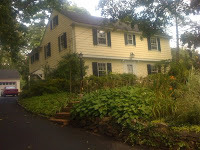 Ma & Pa moved from Brooklyn with their three daughters and settled in Sleepy Hollow, NY aka "North Tarrytown". What a great place to grow up. A small river town just a stones throw from Manhattan. I'd be lying if I didn't admit that it's hard to say goodbye to the place that formed so many of my memories, that formed who I am as a person. Happiest memories of mine: running around the neighborhood, rollerskating, knowing the inside of every house in the 'hood, sledding down the driveway in silver saucers, and neighborhood friends many of whom I'm still buddies with. May the new owners form happy times of their own.